For the first time this season I was left feeling disappointed by The Walking Dead. This week’s episode “Internment” dealt almost solely with the outbreak of sickness at the prison. The first half of the episode showed Hershel (Scott Wilson) tirelessly trying to keep all of his patients alive. Meanwhile, most of them are spitting up blood and bleeding from the eyes. While I like the idea that things have become pretty dire, I got the point after the first 10 minutes and by the end of the first half-hour I was getting a little tired of it. Luckily things ramped up when some of these patients began to die and turn to walkers in the medical ward. 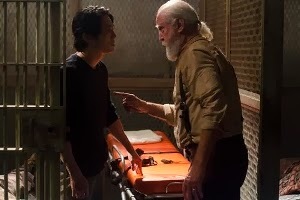 Glenn (Steven Yeun) seemed like he was going to be done in by the illness, but somehow he managed to hang on, barely breathing during the entire walker outbreak. While I’m not anxious for Glenn to die, I wasn’t entirely buying his survival. More than that, I could hardly believe Hershel made it through the whole thing. But that is because the only people who died are characters we don’t really know. I was a little disappointed in that. Not that there is anyone in particular I don’t want on the show anymore, but I had thought we were going to get some new blood (no pun intended) this season. 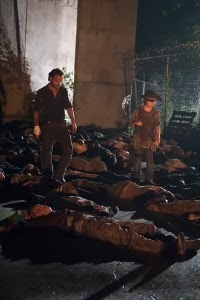 Now they have managed to kill off almost all of the Woodbury survivors. 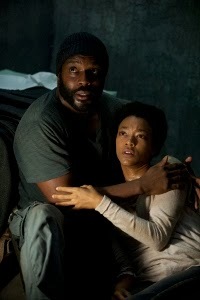 At the very least we still have Tyreese (Chad L. Coleman), who hasn’t been given a lot to do yet, but shows potential. We also have his sister Sasha (Sonequa Martin-Green), who also hasn’t been given anything all that noteworthy to do, but there’s still time if they don’t kill her off. To my surprise one of the more interesting new characters is Lizzie (Brighton Sharbino), the pre-teen who regards the walkers as still being people – “just different.” One moment she expresses compassion for the walkers and in the next she is ready to kill. She could turn out to be a loose cannon if they decide to go that direction. Not much else really happened in this episode. Once again the walkers stormed the fence and it seemed like all would be lost, but somehow Rick (Andrew Lincoln) and Carl (Chandler Riggs) were able to wipe out what looked like a couple hundred walkers all on their own. I’m not sure how that worked, but no time was spent dwelling on it, so I guess I can set it aside. The point of this episode was to show that the prison is no safe haven. So far that has been the point of every episode this season, so it would nice if they could turn a corner on that. I was disappointed in this episode because none of the events really furthered the storyline. In fact it all seemed like a way to hide the real surprise, which of course is the return of the Governor (David Morrissey). It was revealed at the end that he has found his way back and I’m assuming he’s ready to exact revenge. I’m skeptical about them going that direction. I felt like the Governor story should have been wrapped up last season, so I hope they can come up with something more than a cat and mouse game between him and Rick. I’m keeping my mind open though. At the very least it will introduce something new to the story. One more quick note… At the end of the episode, Daryl (Norman Reedus) still hadn’t learned about Carol (Melissa McBride) being cast out. I’m hoping some tension will be introduced once he does know.